This activities manual features a natural approach to building and reinforcing basic Russian language skills. 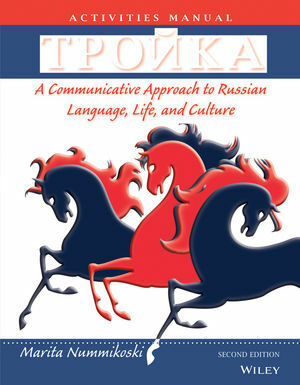 It was written by the Director of Undergraduate Language Programs at the University of Texas who has had decades of experience teaching Russian to Americans, Reading, writing, speaking, and listening activities centered on everyday topics help readers to quickly develop their Russian language skills and to begin communicating in Russian immediately. Grammar is presented as a necessary tool for communication, and throughout the author compares and contrasts American and Russian cultures, rather than focusing solely on Russian culture. Marita Nummikoski is an associate professor and coordinator of UTSA's Russian program. She was named interim chair of the language department at the University of Texas, San Antonio, beginning in the Spring Semester of 2002, and chair the following fall. A member of the UTSA faculty since 1988, she is author of Troika: A Communicative Approach to Russian Language, Life, and Culture, a Russian textbook first published by John Wiley and Sons, New York, in 1996. Since that time, Dr. Nummikoski has added an interactive website to support the text and is working on a second-year Russian textbook with the working title of Sputnik. She received three degrees from Helsinki University in Finland and earned her Ph.D. in foreign language education at the University of Texas at Austin in 1991.